I got out before work agin this morning.. I normally go to breakfast with my friend Chris on Tuesdays but he had a meeting today so I slipped away early and sat down by the Washington Bridge and sketched. 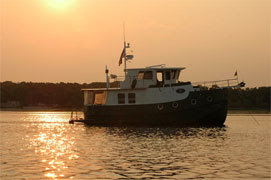 This is the view from the East Providence side of the Seekonk River. The Brown crew teams were practicing and I put on in the picture but I am sure it is not accurate as they were going by quite fast and they just wouldn't hold still for me. I drive over this bridge every day on my commute and of course on the way to the boat as well. . . The sketch challenge continues and this day 12 of 75 days. I did a few over the weekend . 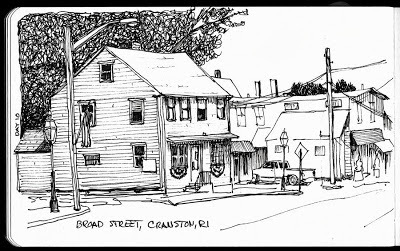 A sketch from Sunday afternoon along Broad Street in Pawtuxet Village. It was a hot day to be out sketching. Check out my other drawings on Flickr - see the link on the sidebar.